What is a Carat And How Big is 1 Carat? Everyone has heard about the massive diamond rings celebrities are sporting nowadays, but what is a carat and how big is 1 carat exactly? This article will clear up common misconceptions and give you an idea of the real size of common diamond sizes. First of all, a carat is not a measure of size, but of weight. A carat weighs exactly 0.2 gram (200 milligram). Because every gemstone has a different density you cannot simply say that a 1 carat gemstone is ‘this big’. The density of a ruby for example, is almost 50% higher than that of an aquamarine. Which means that a 1 carat ruby is almost a third smaller than a 1 carat aquamarine! Another thing to keep in mind is that the cut can have a large effect on how big a gemstone looks when set in a ring. For example if you compare an emerald cut diamond with an modern round brilliant cut diamond that look roughly the same size, the emerald cut will be a lot heavier. To complicate things even more the emerald cut while heavier is probably not more expensive. The reason for this is that the emerald cut is a very economical cut where less material is wasted. On top of that it is important to know that there is a difference in 1 carat total weight of diamond and a 1 carat diamond. The former means that the total combined weight of the diamonds in your piece of jewelry is 1 carat. The latter means that the single diamond weighs 1 carat. This can be a huge difference, a ring with a 0.5 carat diamond surrounded by two 0.25 carat diamonds will be far cheaper than one with just a single one carat diamond. How Big is a 1 Carat Diamond? If you want to know how big a one carat diamond is: 6.4 mm in diameter (1/4th inch). This is for an excellent cut modern round brilliant diamond, which is by far the most popular cut for engagement rings. The half carat diamond we talked about earlier has a diameter of 5 mm, so it will look about a third smaller. The difference in price? 75-80%. In some cases a single one carat diamond will look out of place if you have small hands. In which case you can save lot of money by buying a half carat diamond (flanked by smaller diamonds if you prefer) and look better at the same time. Just how big are the massive diamond rings mentioned at the start of the article? 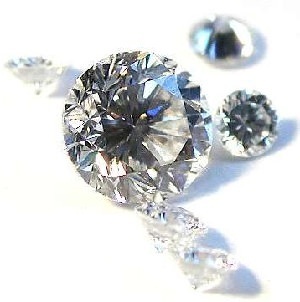 Let’s take a 10 carat round brilliant diamond as an example, which has a diameter of 14.5 mm. This means it will look about 5 times larger than a 1 carat diamond. The price difference? Multiply by a hundred and you’re getting close. We hope you’ve gotten a good idea of the different sizes of diamonds and why it can pay to settle for something slightly smaller. If you have any further questions or need advice please leave a comment below or contact us.